(1) According to parent/guardian self-report in the RHS 2002/3, 1.8% of participant First Nations children (aged 11 and under) suffer from Fetal Alcohol Effects (considered a broader diagnostic category). First Nations information Governance committee. First Nations Regional Longitudinal Health Survey (RHS) 2002/03: Results for Adults, Youth and Children Living in First Nations Communities, Second Edition. Ottawa: Assembly of First Nations; 2007. http://fnigc.ca/sites/default/files/ENpdf/RHS_2002/rhs2002-03-technical_report.pdf -accessed August 22, 2017. *Health Canada. 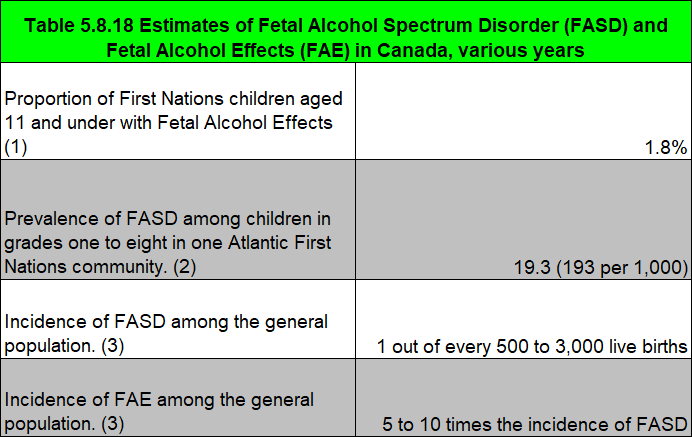 Fetal alcohol syndrome/Fetal alcohol effects – First nations, Inuit and Aboriginal Health. Health Canada website. http://www.hc-sc.gc.ca/fniah-spnia/famil/preg-gros/intro-eng.php -accessed August 2, 2017. Source: CICH graphic using data adapted from Smylie J and Adomako P. Indigenous Children’s Health Report: Health Assessment in Action. 2009. http://caid.ca/IndChiHeaRep2009.pdf -accessed July 28, 2017. 1Smylie J and Adomako P. Indigenous Children’s Health Report: Health Assessment in Action. 2009. http://caid.ca/IndChiHeaRep2009.pdf – accessed August 2, 2017. 2First Nations information Governance committee. First Nations Regional Longitudinal Health Survey (RHS) 2002/03: Results for Adults, Youth and Children Living in First Nations Communities, Second Edition. Ottawa: Assembly of First Nations; 2007.available at: http://fnigc.ca/sites/default/files/ENpdf/RHS_2002/rhs2002-03-technical_report.pdf -accessed August 27, 2017. 3Systematic Review on the Prevalence of Fetal Alcohol Spectrum Disorders, Institute of Health Economics, Alberta, Canada http://fasd.alberta.ca/documents/Systematic_Prevalence_Report_FASD.pdf-accessed July 15, 2017. 4Health Canada. Fetal alcohol syndrome/Fetal alcohol effects – First Nations, Inuit and Aboriginal Health. Health Canada website https://www.canada.ca/en/health-canada/services/first-nations-inuit-health/family-health/healthy-pregnancy-babies/fetal-alcohol-syndrome-fetal-alcohol-effects-first-nations-inuit-health-main-page.html– accessed July 24, 2017. 5Public Health Agency of Canada. Fetal Alcohol Spectrum Disorder. http://www.phac-aspc.gc.ca/hp-ps/dca-dea/prog-ini/fasd-etcaf/index-eng.php-accessed August 2, 2017. 6The full spectrum of effects associated with inutero exposure to alcohol are commonly referred to as fetal alcohol spectrum disorders (FASD). 7Tait, C.L. (2003). Fetal alcohol syndrome among Aboriginal people in Canada: Review and analysis of the intergenerational links to residential schools. Ottawa, ON: Aboriginal Healing Foundation. 8Indian Friendship Centres. (2013). Fetal alcohol spectrum disorder: A position paper. Toronto, ON: Author, p. 4.